Learning how you react to certain situations will help you better predict and prepare for your emotions, and learning about what different emotions do to you will help you decide how to modify your responses to better handle your emotions. It is important to know that you’re not alone: everyone has emotions, and everyone must find ways to deal with them: that’s part of growing up. The strength of your reaction should be proportional to the perceived threat: if there’s a fire alarm and you see smoke, you should react more strongly than if there’s no alarm and no fire. Don’t waste energy, and don’t introduce unnecessary stress and anxiety. From (The Habits You Will Form in Life), you may have learned to react to dogs with fear because the first dog you ever saw tried to bite you. However, as you learn more about dogs, you will understand that not all dogs will try to bite you, and that the threat of a dog depends on the dog. As a result, you learn to scale down your fear of dogs. This same idea can be applied to many other fears or events you overreact to. Put it in perspective: is this a long term or a short term event? Spilling water once is a short term event, getting braces is a long term event. Long term events usually matter more than short term events. However, the impact of the event on your life matters as well: someone spilling water on you once a day for a year isn’t as bad as someone hitting you with a car once. Ask yourself if you can do anything about it, ask yourself whether the window of opportunity to make changes has closed: you can’t change the past, so if it’s too late to do anything to affect the event, all you can do is accept it and manage your reaction so that you can move on. Part of happiness is accepting your present situation. If you can’t accept your present, then whatever you don’t accept, that will be your barrier to happiness. For example, let’s say with your current financial situation you have to wait 2 months for something, while you know others only need to wait two days to earn enough for it. You might believe that if you had another person’s timeline you’d be happier, but that’s not true. The logic that your mind is using is that “better” is “happier,” but when you get that “better,” you’ll find another “better” that keeps you from being happy again! Don’t let the fact that there is something better, or someone better, keep you from being happy. You have all you need to be happy already: all you need is what you already have. The key to maintaining happiness is to know what your happiness triggers are and to set up your life such that you will run into them frequently enough to satisfy you. If you want to formalize it, you can build yourself a happiness investment portfolio. Happiness as an investment strategy: what do you pin your hopes and dreams to? When you add something to your portfolio, ask: Is it sustainable? Is it reliable? What is the risk profile of this happiness investment? Happiness is a decision and a mindset within your control. I could choose to be stressed out today or I can choose to enjoy the day. Take control and responsibility for your feelings. Don’t let other people create and describe your reality for you. Don’t let someone else redefine your perspective of your life–don’t let someone else tell you that you aren’t happy, you should shape and decide your own reality and fate. Happiness is knowing what you want, and then getting or doing what you want. The first step is wanting something: if you want nothing, or you don’t know what you want or what makes you happy, you won’t be happy with anything! Happiness is a dot product between what you want and what you get. The second step is taking action: Happiness is achieved by psychologically programming yourself (The Habits You Will Form in Life) to associate an trigger with a response of happiness. Busy Trap: Distracting yourself from your sadness by being busy in order to delude yourself into being happy. This leads people to have mid-life crises when they’ve accomplished a lot in a career that actually didn’t want, but didn’t notice because they were too busy achieving. Try to make sure you enjoy the activities you busy yourself with. Happiness is not a waste of time and money. It is crucial to keeping you sane, productive, and of course, happy. Overcome the logic that says you can’t be happy right now: you have work to do so be happy later. Why not be happy now, and then work happily? You are missing out on your own life when you waste it feeling like you’re missing out on other people’s lives. If you want to do something, make it happen, or do something else. Don’t waste time doing nothing but wistfully yearning for an alternative life: make your life into the kind of life you want. Put in the hard work necessary to succeed. Maybe you don’t have to try everything once. Do you want to know what everything tastes like? How do you know what the floor of your bathroom tastes like if you don’t do it–at least try it once! That example breaks the logic of “try it once;” so do what you want to do. When someone recommends something, take it as a recommendation, not as a need. Don’t let the existence of another option take away from the happiness you already have. Don’t mistake a need for a want. Yes, trying new things is necessary to discover what you like, but if you’re happy already, then you don’t need to. Instead, do it because you are interested or excited about the opportunity. If, on the other hand, you are unhappy, then it is necessary for you to try new things in order to find what makes you happy. 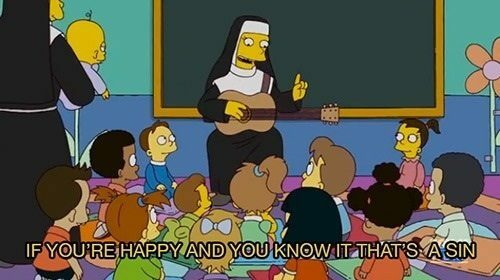 Religion taught me Happiness is a sin. To achieve happiness, you must break free of that kind of religion. Morality for me has changed: it used to be the teachings of religion. Now it’s whoever I happen to hang out with; whatever social structure I am a part of. Religion: God hates you, don’t be who you are. Religion: you can’t love yourself, because you’re a sinner and evil, so you should despise and hate yourself as God hates you. Religion: Evil is happiness that is acquired through any means other than through God directly. Therefore, manmade things, things of this world, which is controlled by Satan, are all evil and to be avoided. Happiness in this world is temptation which will lead you away from God and into Hell. As explained in Commensurate Reaction, some of your fears may be overreactions. If you find yourself saying “I will never __ because __.” Simulate yourself doing __ and consider what the real harm and possibilities and probability distributions are (See http://attemptedliving.com/2014/02/26/important-life-knowledge/). Then ask yourself, is it really that bad? Your imagination and habits will remind you of all the reasons that you have this fear. Let them go. What you resist persists. It is very unsettling to not know (see Decision Making: Ambiguity). As a result, our typical response is to create false realities, because having something to believe in is comforting even if what we believe in is false. However, it is important to recognize the difference between imagination and reality–if it is an imagined fear, then it is not a legitimate fear. Do research, ask peers, so you can know the truth, and conquer the fear of the unknown. For a variety of reasons, some people will target you if you show happiness. They might have sad lives and want to bring you down to their level, or they might think ethically you should not be happy. If you grew up or have dealt with people like that, you may have developed a fear of happiness. However, I have since learned that the persecution I suffered was an isolated occurrence: some people will target you, but there are others who won’t. Find and spend time with the ones who share your happiness, avoid those who target you. Be smart about happiness, just like one should be smart about safety. If there is no threat, then don’t be afraid, don’t hide: have the strength to be happy. Again, as explained in Fear:Overcoming, size up the situation. If the rejection won’t kill you, and you can handle it, go for it. This way you explore all your options, instead of filtering and limiting yourself from the get go. There are enough restrictions in one’s life already, there’s no need to add more of your own if you can help it. Boundaries are constantly changing. You can only know if they moved if you test the waters. Everyone fails or makes mistakes, and the failures and mistakes never stop coming so long as you live. The quicker you accept them and as not a big deal, the sooner you can work to improve, as well as learn to deal with them calmly. Don’t let success get to your head and affect your perception of reality: just like failures and mistakes, success comes and goes. Plan for it: What are you going to do after you achieve it? No one subject, occupation, or category is superior to the others. Titles within a category, like white belt, red belt, black belt martial arts have a superiority order; your manager is superior to you within a company. However, martial arts cannot be compared with your employer–they are just different, not superior. Engineering is not superior to music and art, nor is humanities superior than science–they are just different subjects. Try to go out for honest enjoyment when you’re healthy and fit enough–if you’re tired, you’re in a bad state (http://attemptedliving.com/2014/02/13/how-your-health-affects-conversations/) and you should be resting. Recover your health, hanging out can wait. Don’t use people to cure your loneliness: You are basically showing up and telling everyone else, entertain me. Relationships are a give and take, don’t be a leech. When you’re lonely, you tend to put others first because you are feeling low self esteem. As a result, you take less good care of yourself–you might make too many sacrifices. This puts you in a weakened physical and mental state that further lowers your self esteem. I tried to solve it by placing myself into as many lives as possible, but eventually I realized that I feel empty and alone not because I’m not in other people’s lives, but because they aren’t in mine. My life is empty of people not because they don’t let me in, but because I don’t let them in. I keep making friends, then moving on to make new ones. Part of this is just life–friends will come and go. However, you should put in some effort to stick with people you want to. Real loneliness I learned is not just lacking family or friends, it’s not having a network of any kind. To know no-one and have no human connection, wandering the world with nothing but material things: that’s loneliness. Why do we want others to be jealous? What’s the advantage? It is purely self-serving, to feel desired and worthwhile; give us worth when we feel worthless. If you have self worth, you have no need to goad others into being jealous of you–what others think doesn’t matter, you’re already satisfied with how you are because you are secure in what you are. Correcting your source of self worth will allow you to be happy for others without feeling envy or jealousy. When things go wrong, or people disrespect me, have the mental health to shrug it off. Minimize the damage by letting it go, rather than holding onto it and prolonging the damage. Avoid bitterness and resentment. One way depression happens is when you are not happy about something, but rather than do something about it to fix it, just keep making/letting yourself feel bad about it. In this way, laziness fuels depression in a vicious cycle of not fixing the problem, so being depressed, so not fixing the problem. Inconsistency promotes depression: going from one extreme to another is unhealthy. If you are sad, so you do lots of happy things and become very happy. Then stop doing happy things, you’ll drop back to being sad again. Within a day or two, or even within a week, this is fine, but if you go a month being happy, then a month being sad, that’s too extreme. Feeling worthless. Overcompensating responses like superiority complex. You don’t have to be a jack of all trades to be impressive. Just do what you enjoy. When things go wrong, the mentally healthy response is concern, the sick response is depression or sadness. I tried to keep a plant alive for as long as possible. A peppermint plant I named Pepper. However, when Pepper began to die due to infrequent watering, I began creating delusional realities about all the different ideal solutions I could have: I could hire a gardener, I could build or buy an automatic watering contraption, or I could just water her every day. The problem was I imagined all those things, but didn’t do any of them, and so my plant slowly died from lack of water, at which point the near death experience for Pepper my plant cut through delusions and taught me what reality is: It’s in the actions you take, not in the thoughts you make. So I stopped my idealism and faced the reality I didn’t want to face: need to work hard to save her, and I did. If you had a loved one who had a heart attack, will you ignore it and hope that it will just go away? Or will you call 911 and get a doctor to do something about it. Accept the painful reality, so that you can fix it, or else it will only get worse when you ignore it. Lesson – Actions exist in reality, thoughts only exist within your mind. Hope and theory only go so far, they won’t save the life of the plant without action. Thinking about calling 911 does nothing: actually calling 911 does. Venting to get over emotions is fine if it’s done safely, without hurting yourself or others. However, it is important to distinguish between venting and complaining, because complaining is not productive. Here’s the difference: venting is you have emotions and you need to express it: I want to express how angry, frustrated, unhappy, etc., I am. That is venting. Complaining is when you don’t like what you see, have, think, etc. : it’s an expression of how you don’t like something, and a wish for things to be different. Either make a decision to do something and make a change, or accept the reality: don’t waste time, breath, and energy complaining. In life, you will encounter many situations that trigger a variety of emotions. it is impossible to never experience anything that would trigger anger. When Anger is triggered, it is your responsibility to handle it: some people dissipate it, some people bottle it up. You should not bottle it up, but you should also control when and how you dissipate it, so that you don’t harm others, or harm yourself. This post is part of AttemptedLiving’s Life Education Curriculum, a collection of core knowledge everyone should have. I was recently asked about rivalry between Berkeley and Stanford. The question was: are Berkeley students passionate about school pride. Followed by, are you passionate about school pride. Answer with the Truth: there are people who care about the rivalry, and there are people who don’t care. I am someone who doesn’t care. Conversation ends. I answered with the truth, because the context of the question was “Stanford students are cool as a cucumber, whereas Berkeley students are dumb for spending frivolous energy on trivial pursuits,” and if I made the conversation interesting, I would attach to my identity the accusation that I am someone who frivolously pursue trivial things like over-exaggerating school pride. I remain convinced that, for this particular instance, I made the right decision. However, I cannot help but be bothered by the loss of potential for fun, because the rest of the conversation was not as engaging or fun as it could have been if we played around with school pride. The hypocrisy within this whole situation is that everyone spends frivolous energy on trivial pursuits sometimes: that’s what having fun is. All work and no play is not the way to go. As such, why hide the “truth,” which is that I am someone who frivolously pursues trivial things, sometimes? From what I know about human nature, and perception, and how people for identities of others, I know that the imprint of this interaction on overall identity will take more work to erode than if I wait for another opportunity to demonstrate fun. At the same time, I suppose it is fair to look at it from the alternative point of view, which is that I am strongly signaling that I am no fun. Seems like a lose lose situation. Try to reduce the repetitive decisions in your life: Instead of having to choose what you will eat for breakfast every…single…day…try deciding what you will eat for breakfast everyday, and then just make exceptions when you want to. The key is that you are reducing the number of decisions you face each day so that you preserve your mental energy for the important decisions. Stay tuned for an application AttemptedLiving will release to help you make decisions and save your brain power from unnecessary work. Procrastination depletes your focus and decision making energies because you waste energy to make the decision to procrastinate, so that by the time you start work, you’ve spent energy on the five, ten procrastination decisions prior. Track and reduce wasted time. Ask yourself: Are you making good use of your brain power? What are you thinking about most of the time? Is it useful, helpful, beneficial? Don’t waste your limited resources on thoughts that yield little value. I spend too much time refreshing Facebook, gmail, reddit, etc., waiting for things to happen, and then procrastinating when emails or messages/activities/events come in. This is a huge waste of time: focus on doing active things rather than passive things. Have a purpose. If I’m on gmail, the purpose is to read and answer emails to move on to do other things, not to passively wait there refreshing. Also, block your time: instead of checking email every few seconds, and therefore wasting time whenever there’s nothing new, check email or social media once every hour or two, so you can process all the activity for the last hour or two all at once. Sometimes you should stop and fix a problem before moving on, and sometimes you can and should just move on and be fine. Recognize how necessary it is and decide if it’s a worthwhile investment of time and energy. For example, I might want to read a wikipedia page about Ponies, but then on the Pony page I see a link to Industrial Revolution. If I don’t know what Industrial Revolution is, I might want to click it, but then I might find something on the Industrial Revolution page that I don’t know, which if I click would get me further away from my goal of reading about ponies. If, on the other hand, my interest in reading about ponies is to find out its involvement in the Industrial Revolution, then I do need to learn about the Industrial Revolution before proceeding. If you have five tasks and you only have time to do three, focus on the important problems that have the greatest impact. As your life gets more complicated, you must learn to let things go: choosing which tasks to consciously fail is a strange thing to learn, but an important skill to have–from it, you learn what is truly necessary and what isn’t. You don’t have to be perfect, just good enough, and you can work it out as you go. If you have time to complete three tasks, or perfectly complete one, depending on whether you can fail the other two, you should sacrifice the perfection of one to get the other two done. One time, I was looking for parking, and I found a good parking spot close to the destination but on dirt, so I decided to pass on it and look for something better. Once I passed it, someone else instantly took the parking spot I determined was not good enough. After another fifteen minutes of searching, I then had to settle for a parking spot slightly further, and still on dirt. So it is with opportunities in life. The lesson here is that time is the limiting factor for perfection–instead of saying I will say yes to when I have the best option, set a deadline based on available resources, and say yes to the best option at the time of the deadline. Timidness often results in disappointment, unproductiveness, inactivity, and depression. Timidness is when you want something, or you have something to say, or there’s something you want to do, but you don’t get it because you’re too timid to do anything. Given how almost nothing good comes from timidness, it will be wise to want to not be timid! Timid is not the same as polite or respectful: I am not saying that you conquer timidness by simply reversing your behavior. You still need to know when to speak up and when to stay quiet–however, when you do think it’s time to speak up and you do want to, do so: it is that case that I am referring to here, and in that case, conquer timidness. Ambiguity introduces problems because you have nothing concrete to make decisions on. Should I bring my swimsuit to the party? If we are swimming, yes, if we are not, no. If we are not sure….then I have to weigh regret and chance to make a gamble on what the best decision is. Being decisive gives yourself and others concrete details with which to make decisions by. Leadership: When it comes to a group, there needs to be a clear leader or leaders. All followers won’t work because no-one would make a decisive decision. All leaders won’t work because no decisive decision can be made if there are disagreements, so little progress is made. Both cause ambiguity which causes chaos and headaches from miscommunication and bad coordination. Case 1, you know the right thing to do. Then it is to everyone else’s benefit that you tell them, so you are justified and being a good person by speaking up and deciding. If others disagree, then that’s fine, at least you tried. If anything happens, talk it out. Case 2, you don’t know the right thing to do. Then all proposals are equally good, since if someone else knew the right thing, case 1 would happen. Since having a decisive answer is better than ambiguity, put everyone out of their ambiguous misery and make a decision. Worst case, talk it out. If someone wants to know how much pizza to buy, and you ambiguously answer, then they don’t know how many slices to get–you are making it difficult on others, so just answer the question. People put a few options up to a vote, and you are the tie breaker somehow. Everyone knows that the process is democracy, and they have accepted whatever result occurs–they will not hold it against you for choosing something they don’t like because it’s not your one vote that caused it, it was everyone’s votes together. Therefore, just make the choice. If everyone is being overly considerate, then everyone is suffering from timidness and ambiguity: be the one to put them out of their misery. I usually presume I am the least desirable and least wanted person in the room. If I’m talking and someone else interrupts, I instantly give up the ground. I prioritize myself last, and see myself as a servant of the people–I see myself as a lower class citizen. Recognize the context: is this true? If not, don’t act like it is. If you feel this way when it’s not true, it is probably a habit built up by childhood. Overcome it (See Life Education Curriculum)! Spend the appropriate amount of time based on how important or major the decision is. I have a tendency to spend a lot of time on easy decisions to make myself feel better about life because it makes me feel empowered when I can take control of so many details, and very little time in difficult decisions so that I minimize the time spent feeling powerless and not in control. This is a bad habit that results in sub-optimal spending of decision making energy, and results in sub-optimal decisions. Unlike money, you cannot change the speed at which you spend time. Stinginess and the desire to save money are philosophies that also don’t apply to time: you cannot avoid spending it one minute at a time. Too many people focus on learning how to save, but that mindset will not help you with time. You can’t succeed in life by only knowing how to save: you must learn how to invest and spend wisely, at the fixed rate of 1440 minutes per day! Lack of spending can come from a lack of a sense of security–if you believe you’ll never get another something again, you will keep it and hold onto it, not letting go. It is important to know the difference, however, between something irreplaceable and something replaceable. Don’t overspend on preserving replaceable things, and don’t underspend preserving irreplaceable things. Another possible reason is that you feel like the world owes you something, and so you mistake this individual transaction between you and another person as a relationship between you and the world–that you are justified in taking this item from this person. This is inaccurate, and acting this way causes burnt bridges and lost friendships. Financial goals: define a budget and a goal, don’t let it be a principle of saving as much as possible, because it causes you to be overly stingy all the time. Having a budget and a financial goal takes away the stress and fear around money, and gives you a concrete detail with which to make decisions by, so there’s no ambiguity (and pain from it, see above). Furthermore, few people like stingy people, and people usually remember the stingy person, and you don’t want to be known as that person. It’s a waste of time, uncaring, mean, and builds a negative reputation. I used to think sacrificing personal time was a noble thing to do, that it made me more important, because it implied I was doing work that was of such high priority that I must give my life to it. Now I know it just means bad time management: it is foolish to damage your own health as a way to give yourself and your work more meaning. Only do so if you actually need to. Dedication is not measured in sacrifice. A Bankroll is how much money a professional gambler sets aside for gambling, so that they don’t bet more than they can afford to lose. You should use the same mindset for investing in life. http://www.pokernews.com/strategy/bankroll-management-with-jonathan-little-part-1-8691.htm Be patient, level up slowly, after you’ve mastered the level you’re at, not before. You never know for sure if it’s going to work or not, until you try. Don’t fool yourself into thinking that you know when it’s going to work: a lot of things are outside your control which can influence the outcome. So get used to rejection and failure, or face the problems outlined above in timidness and ambiguity. Let the other person say no: relationships, work, life, etc. Don’t reject yourself before you are rejected: at least try. How to Make Hard Choices by Ruth Chang (TED Talk) – explores the nature of choices. To find out when more Life Education Curriculum (Self Improvement Section) is released, subscribe on the side! Follow on Twitter, on Facebook, on Google+, on Tumblr.